It was the day after Happy Meal's birthday party, and I could not face more leftover cake and/or pizza. I talked him into checking out Rush Street over in Culver City. I didn't have high hopes for it, but I figured that it couldn't be worse than Ford's Filling Station across the street. I was correct, but just barely. 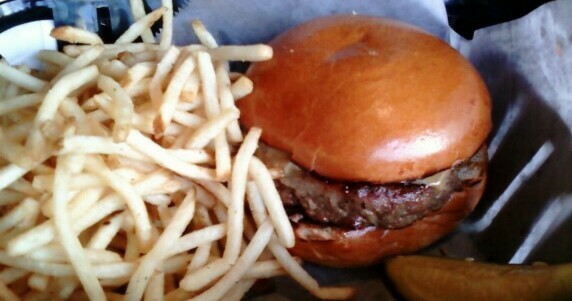 I ordered the 12 dollar Rush Street Dry-Aged Burger w/ fries. 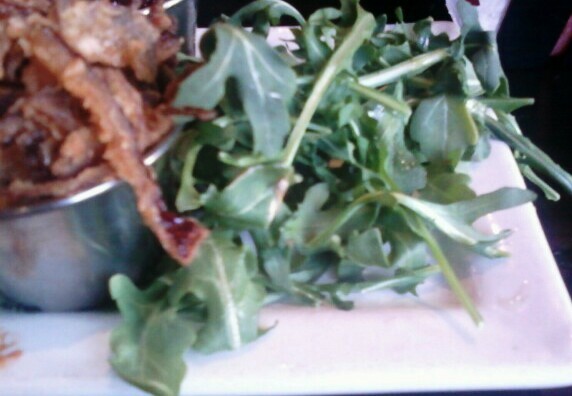 It came with apple wood bacon, Cheddar, shoestring onions, arugula, and a confire sauce. I ordered everything but the cheese on the side. The Beef: My waiter claimed that the beef was a blend of USDA Choice, dry-aged Sirloin and Chuck--he went on to explain that the blend was mostly Sirloin. Maybe it was...I can attest to the fact that the beef was DRY. When compressed, the beef did yield some fat but no water. The flavor of dry-aging was weak at best, and the beef flavors were very mild. 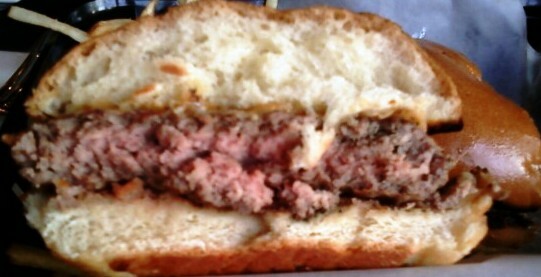 The beef tasted like a low-grade Sirloin burger cooked to Medium Well, but they only cooked it to a hair under Medium. The beef was simply not good enough for a 12 buck burger. The Sear: They got some grill marks on the burger, and judging by the depth of the indentations on the surface of the patty, one could draw the conclusion that someone in the kitchen had actively pressed the juices out of the burger while it was cooking on the grill. That would have explained the dryness and lack of flavor in the beef. The Seasoning: The exterior of the burger patty was properly seasoned with salt and pepper. The Preparation: They cooked the 6-7 ounce burger a little too long on a very hot grill. The heat of the grill was evidenced in the burnt edges of the grilled bun. The beef blend was ground to medium. The Cheese: It was Cheddar, and it was bland. 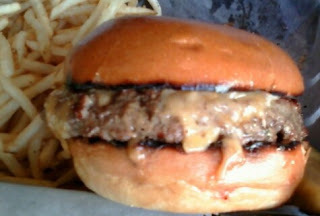 The Cheddar never stood a chance...it was up against too much dryness from both the beef and the bun. The Bun: DRY. The brioche-style bun was grilled hard. 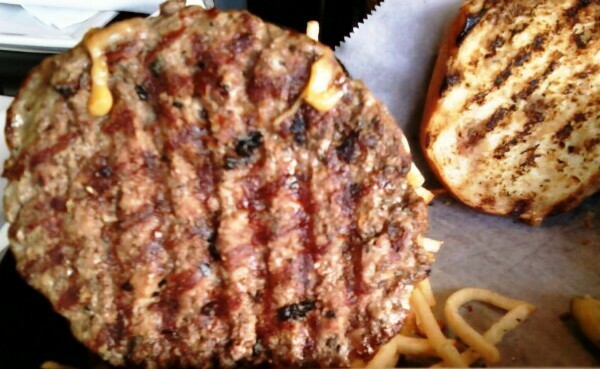 Whatever super drying powers that grill used on the burger meat, it also used on the bun. This equated to a lot of beverage to help wash this mess down. It was like eating a bag of cotton balls. The Fries: The skinny fries were pretty darn good. They were nicely seasoned and crisp. The fries were better than the cheeseburger. The Sides: All of the sides seemed designed to further dry out the cheeseburger. The arugula was 2 days past being fresh enough to serve. The fried onion strips and bacon would have added nothing but dryness. The "confire" sauce was onion in BBQ sauce. I found the idea of onion strips and onion sauce on the same cheeseburger to be overkill. The Value: At $12 for a dry burger, the value was weak. Culver City is a microcosm of San Francisco when it comes to burgers. A lot of mediocre burgers in a small area. Rush Street did its part to inject truth into that statement. Rush Street can be safely avoided when it comes to filling a cheeseburger void. Burger Review : A dry and bland cheeseburger was eaten and not enjoyed at Rush Street.